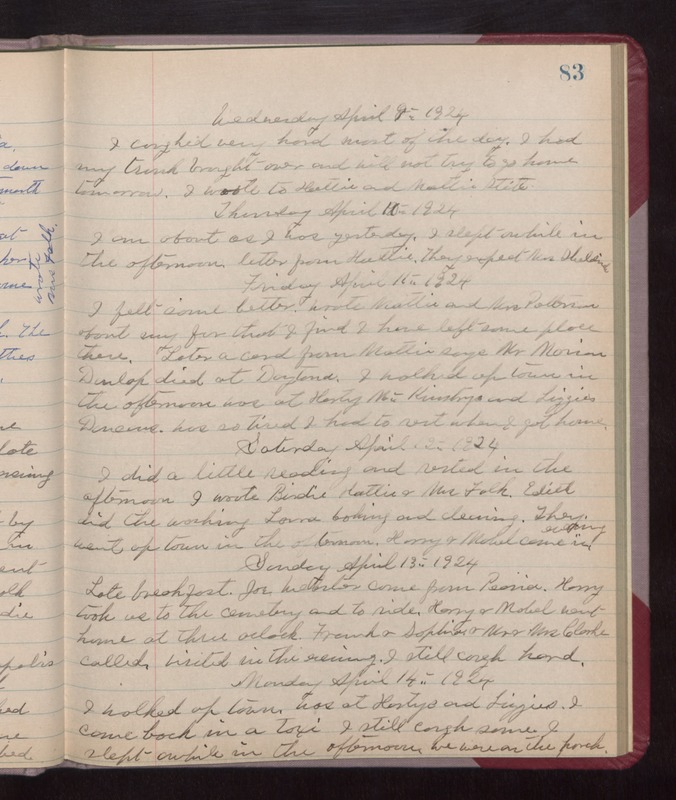 Wednesday April 9th 1924 I coughed very hard most of the day. I had my trunk brought over and will not try to go home tomorrow. I wrote to Hattie and Mattie Stitt. Thursday April 10th 1924 I am about as I was yesterday. I slept awhile in the afternoon. Letter from Hattie. They expect Mrs Sheldrick. Friday April 11th 1924 I felt some better. Wrote Mattie and Mrs Patterson about my fur that I find I have left some place there. Later a card from Mattie says Mr Marion Dunlap died at Daytona. I walked up town in the afternoon was at Harty McKinstrys and Lizzie Duncans. Was so tired I had to rest when I got home. Saturday April 12th 1924 I did a little reading and rested in the afternoon. I wrote Birdie, Hattie & Mrs Falk. Edith did the washing. Laura baking and cleaning. They went up town in the afternoon. Harry & Mabel came in evening. Sunday April 13th 1924 Late breakfast. Joe Webster came from Peoria. Harry took us to the cemetery and to ride. Harry & Mabel went home at three oclock. Frank & Sophie & Mr & Mrs Clarke called. Visited in the evening. I still cough hard. Monday April 14th 1924 I walked up town. Was at Hartys and Lizzies. I came back in a taxi. I still cough some. I slept awhile in the afternoon. We were on the porch.